This Error Message Article explains the TEKLYNX CENTRAL / LABEL ARCHIVE error message “There are no permissions to process the request.” and details how to fix the underlying problem that caused it to appear. This error message appears when the operator attempts use features in UMSS that requires a specific type of access (Delete, Update, Insert, or Query) to one or several UMSS database tables. 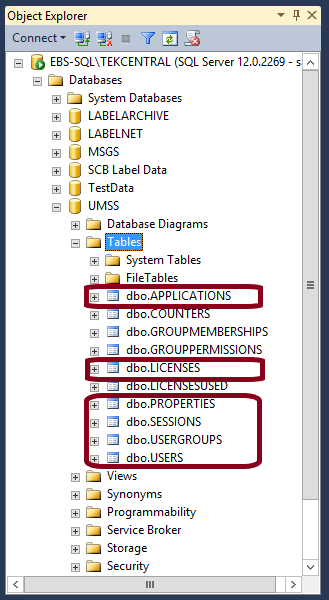 If the operator belongs to a user group where permissions in one of the tables listed in the “Data Access” section of one of the modules (i.e. UMSS, MSGS, or LAS) is restricted, then the error message appears when TEKLYNX CENTRAL / LABEL ARCHIVE tries to access data on that table. 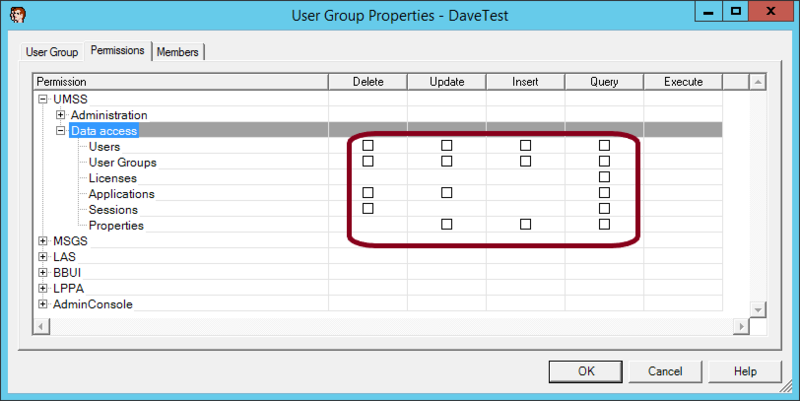 Change the User Group permissions by clicking the appropriate checkbox(s) in the “Data access” section. For the permissions given in the UMSS / Data Access section (described above) to have any purpose or effect, permissions to the appropriate nodes or screens in the UMSS / Administration section (described in the UMSS / Administration section above) must be given. A user given “Delete”, “Update”, “Insert”, or “Query” in the UMSS / Data access / Users permission will not get far if the “Execute” permissions in the UMSS / Administration / Users section is unchecked. For example, if a user is given the “Query” access to the UMSS Users table by selecting the “Query” checkbox in the UMSS / Data Access / Users permission but the “Execute” checkbox is unchecked for UMSS / Administration / Manage Users, they will get the “No permissions to view these items” error message when they select the “Users” node on the screen. The reason is that, although they have “Query” capabilities in the UMSS / Data Access / Users permission, access to the entire User node or screen is blocked. This is due to “Execute” value in the UMSS / Administration / Manage Users permissions being unchecked. In other words, the user cannot access the Query rights given in the UMSS / Data Access / Users permissions until the access to the User node is given in the UMSS / Administration / Manage Users permission.